Mitsubishi's Illinois plant opened in 1988 as Diamond-Star Motors, a joint venture between the Japanese automaker and then-partner Chrysler. TOKYO -- Mitsubishi Motors Corp. will shutter its only North American assembly plant by November if it can’t find a buyer for the factory, and will soon start shipping tooling back to Japan. Mitsubishi has several candidates, including at least one Detroit manufacturer, but no solid leads, a person familiar with the matter said. The plant would provide an excellent quick fix for carmakers seeking an incremental capacity increase quickly at low cost, the source said. “Our factory is very cheap and has small capacity,” he said. In a statement to dealers and employees in the U.S. on Friday, the Japanese carmaker said it would wind down the underutilized Normal, Ill., plant in November, starting with the halt of production, if no buyer is forthcoming. Mitsubishi said it would prefer an auto-related buyer but will consider all bids. It blamed the Russian recession as the crowning blow for a long-struggling factory. Crumbling exports made it unviable to support production bases in both the U.S. and Japan, it said. Mitsubishi will start transferring tooling for the 2016 model year Outlander Sport to its factory in Okazaki, Japan, the person familiar with the plans said. Mitsubishi had already conducted prototype testing of the facelifted 2016 Outlander Sport, which was slated for production at Normal. The vehicle gets an extensive frontend refresh in line with the looks on the reworked Outlander SUV. Mitsubishi said it remained committed to selling cars in the U.S.
As proof of that, the source said, Mitsubishi plans to bring a sedan version of the Mirage compact hatchback to the U.S. next spring, followed by its Outlander PHEV plug-in hybrid SUV within a year. The next-generation Outlander Sport arrives after that. The decision to end production comes at a critical juncture for the carmaker. In April, Mitsubishi said it booked its first full-year North America operating profit in seven years, as the company’s long-struggling U.S. business gradually stages a rebound. But the plant’s output has since been broadsided by plunging demand in its top export market, Russia. 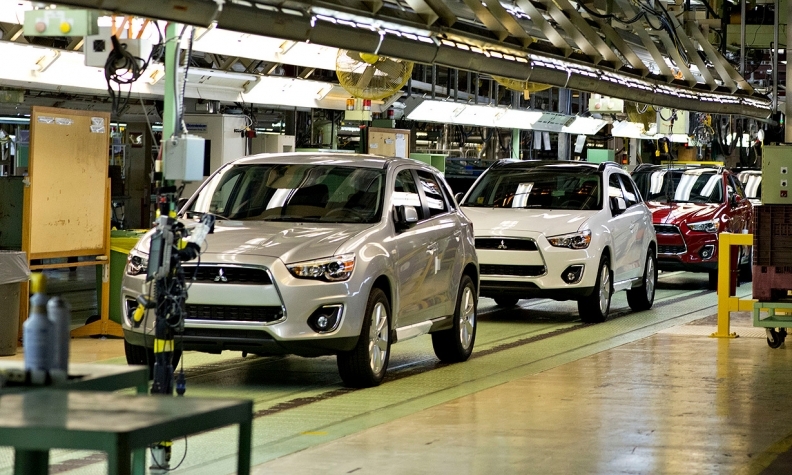 Japan’s Nikkei news service reported on July 24 that Mitsubishi planned to cease production at the Normal plant as part of a strategic shift to the growing Asian market. Mitsubishi said it was working with the UAW, which represents the plant’s workers, to find a buyer. “Mitsubishi has struggled to grow U.S. sales for several years, and its limited product portfolio means many buyers never seriously consider the brand,” said Karl Brauer, a senior analyst at Kelley Blue Book. Through June, Mitsubishi’s U.S. sales soared 25 percent to 49,554 vehicles, lifted mainly by a 17 percent increase in sales of its Outlander Sport compact crossover, the only vehicle made at the Normal plant. Outlander Sport sales totaled 17,893 vehicles for the first six months, or 36 percent of the company’s U.S. sales. Despite Mitsubishi’s return to profit in North America, the brand’s sales are still paltry, and its Normal plant faces substantial handicaps. Total one-shift production capacity is 120,000 vehicles a year, but the factory built just 64,000 vehicles in the company’s latest fiscal year ended March 31. As recently as 2000, the factory was churning out 222,000 vehicles a year. The recession in Russia has undercut demand for the plant’s export production. Last year, the plant exported 29,000 vehicles, with 17,000 going to Russia, Kazakhstan and Ukraine, the company said. Last month, Don Swearingen, executive vice president at Mitsubishi Motors North America, said the unraveling exports are creating “tremendous challenges.” Mitsubishi spends $250 million a year on labor, tooling and other fixed costs to run the Normal plant before a single vehicle rolls off the line, he said. Russia’s recession spreads the costs across a smaller number of vehicles. In the past, Mitsubishi relied on fleet sales to keep the Illinois factory humming. But Swearingen said Mitsubishi has sworn off such habits and won’t hike its money-losing fleet sales. Finding a buyer for the plant will pose challenges. Mitsubishi may hope to catch the eye of rivals looking to expand as the U.S. auto market surges to its highest level in years. But the plant is a quarter-century old and has the dubious distinction of being the only Japanese-owned U.S. auto factory whose hourly workers are represented by the UAW. The union local’s current contract expires in August. Mitsubishi CEO Osamu Masuko repeatedly has said he has no plans to abandon U.S. sales, as Suzuki Motor Corp. did. Suzuki had denied any intention of pulling out, right up until its November 2012 announcement that it would do so. But signs had been building for years. And Mitsubishi’s recent history in the U.S. mirrors some of Suzuki’s path. Suzuki’s sales tumbled after the Great Recession and were further hurt by a dearth of new product. Its number of U.S. franchises nearly fell by half in just four years. And just before its deep dive, it decided to stop manufacturing cars in North America. In late 2009, Suzuki sold its stake in its only North American assembly plant to General Motors. Suzuki and GM opened the jointly owned CAMI plant in Ingersoll, Ontario, in 1986. Mitsubishi opened its Illinois plant in 1988 as a joint venture with then-partner Chrysler.